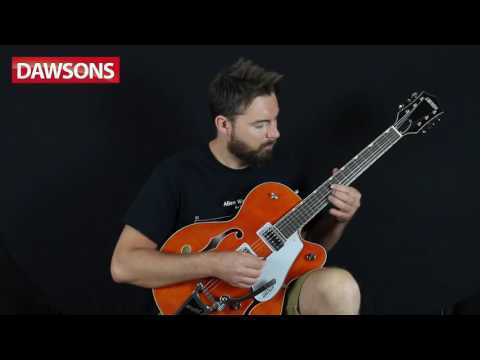 The Gretsch G5420T Electromatic Hollowbody Guitar with Bigsby is a straight up workhorse that is designed to offer tonal versatility in the studio and on the stage. Boasting vintage looks that are combined with modern appointments, and built to Gretsch's customary high standards of quality, this is the perfect model for those who want a guitar that can keep up with the pace they set. Gretsch have designed the G5420T with a hollow body design, which is built using 5-ply maple. The combination of the body profile and resonant tonewood allows the guitar to generate a punchy midrange energy, with stylish over-sized bound f-holes adorning the top to project the acoustic timbre. The top is bound to create a striking contrast to the body finish, whilst the paintwork has been treated to a coating of gloss to protect it against unwanted nicks and scrapes, preserving it for as long as possible. The body is completed by the application of a silver plexi pickguard, which proudly displays a black Gretsch logo. Fitted to the body is a slender maple neck, which is crafted to a "U"-shape profile to guarantee a supportive and reassuring feel in the hand. Married to the neck is a bound rosewood fingerboard, which is home to 22 medium jumbo-sized frets that bear offset pearloid neo-classic thumbnail position inlays. The neck and fingerboard partnership establishes a confident playing feel, encouraging your fingers to roam freely. The 12-inch fingerboard radius allows your fretting hand to roll around in comfort, whilst string bends can be executed smoothly. The single cutaway body profile makes it significantly easier to reach the upper frets comfortably. At the top of the neck is a Graph Tech nubone nut, which works in partnership with the vintage-style open-back tuning machines to uphold string tension and tuning integrity. Fitted to the body are two BlackTop Filter'Tron humbuckers in the neck and bridge positions. Designed to enhance the "fat" timbre produced by the body, this pair produce an enviable tonal arsenal for you to play with. The neck position enhances the plucky articulation of the neck and fingerboard, whilst the bridge pickup draws more from the body, generating a thunderous charge when you want it. Control over the pickups comes in the form of a three-way pickup selector toggle switch, which allows you to select either pickup independently or select both outputs simultaneously for a fuller tone. Each pickup has an independent volume knob, and both are connected to master volume and tone pots. Fitted to the G5420T is an adjusto-matic bridge with a secured rosewood-based, which is paired with a glorious Bigsby Licensed B60 vibrato tailpiece. The hardware creates a seamless connection between the strings and body to optimise intonation and sustain, whilst the Bigsby offers meticulous control over vibrato.